A supernatural story of love, ghosts, and madness as a young couple, newly engaged, become caretakers of a historic museum. When Nick Beron and Hannah Rampe decide to move from New York City to the tiny upstate town of Hibernia, they aren't exactly running away, but they need a change. Their careers have flatlined, the city is exhausting, and they've reached a relationship stalemate. Hannah takes a job as live-in director of the Wright Historic House, a museum dedicated to an obscure nineteenth-century philosopher, and she and Nick swiftly move into their new home. The town’s remoteness, the speed with which Hannah is offered the job, and the lack of museum visitors barely a blip in their consideration. At first, life in this old, creaky house feels cozy—they speak in Masterpiece Theater accents and take bottles of wine to the swimming hole. But as summer turns to fall, Hannah begins to have trouble sleeping and she hears whispers in the night. One morning, Nick wakes up to find Hannah gone. In his frantic search for her, Nick will discover the hidden legacy of Wright House: a man driven wild with grief, and a spirit aching for home. BEN DOLNICK is the author of the novels At the Bottom of Everything, You Know Who You Are, and Zoology. His work has appeared in GQ and The New York Times, and on NPR. He lives in Brooklyn, New York, and with his wife and daughter. "A well-crafted ghost story… Genuinely surprising… Dolnick’s ambitions go beyond run-of-the-mill thrills and chills… [He] serves up a more nuanced account of the couple’s unraveling, leaving us to wonder if their problems are the work of malevolent spiritual forces or a complicated psychological meltdown." "What urban couple wouldn’t want to trade the din of the Q train for the sound of crickets, exchange a cramped apartment for a spacious old building steeped in history, only a few hours’ drive from downtown Manhattan? Think again. Ben Dolnick’s elegant, eerie new novel suggests it might be better to stay in Queens… Dolnick excels at creating a subtle, growing sense of unease… The greater mystery unveiled in this powerful novel lies not in spooky atmospherics, but our own failure to connect with those closest to us." "Looking for another provocative porthole to the past? 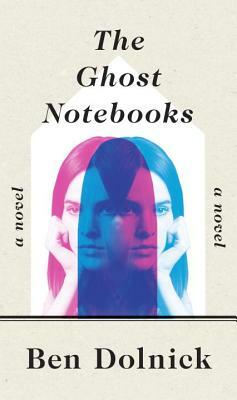 Try Ben Dolnick’s fourth novel, The Ghost Notebooks. The plot provides a durable framework for Mr. Dolnick’s keen eye for detail and his penetrating ear for dialogue." "A missing fiancée and a haunted house in the Hudson Valley are at the enigmatic center of Ben Dolnick’s The Ghost Notebooks, but the real mystery is how well we know those closest to us." "An insightful look at our visions and revisions as we grapple with love and grief… You’ll also likely laugh. A lot." "A ghost story, a mystery, and a love story in one." "Dolnick’s most thematically ambitious work… He has a gift for metaphor, a way of expressing complex emotions and relationships with a pithy comparison that’s easy to understand but genuinely illuminating, and at the same time isn’t a cliché and never feels cutesy… Over a series of short, quietly powerful novels, Dolnick has emerged as an author of compulsive readability and real insights." "For all its curiosity about things that go bump in the night, the most notable features in The Ghost Notebooks are its qualities of light. Ben Dolnick’s charm, lucidity, and insight will come as no surprise to his growing band of fans. Count me one of them." "In this compelling mix of love story, detective story, and ghost story, [Dolnick] takes a haunting look at what might follow life." "Hannah loses her job and applies to be live-in caretaker of the Wright Historic House upstate. She and her fiancé Nick leave Astoria with dreams of a simpler, reinvigorated relationship. And then Hannah disappears. This Brooklyn author delivers an affecting and original take on love, loss, and grief in assured writing that is both poignant and laugh-out-loud funny, sometimes in the same sentence." —Cory Oldweiler, AM New York's "Must-Read Books in 2018"
"According to [Emma Roberts], the unique novel is ‘a supernatural story of love, ghosts, and madness as a young couple, newly engaged, become caretakers of a historic museum.’ I don't know about you, but that sounds like a book I just can't pass up." —Sadie Trombetta, Bustle, "5 Books Recommended by Celebrities & Their Book Clubs in March 2018"
"[The Ghost Notebooks] treads slightly into the supernatural… Perceptive and witty… Passages from various diaries and written materials from the museum are interspersed with more standard chapters that are narrated in first-person by Nick, telling the story of this time in his life to an unidentified person at some point in the future. Dolnick’s facility with description and scene-setting is enviable. He manages to get in all the sights and sounds a reader needs to feel in the moment."